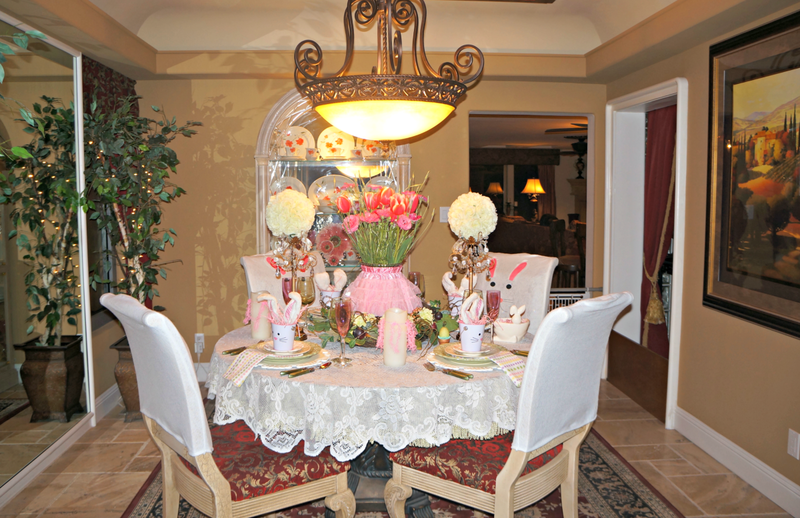 Easter is coming on fast, so I thought I would create a special Easter bunny tablescape in our Breakfast room. The beautiful flowers are from the Farmer's market. They have the prettiest flowers there and are so reasonable. The french doors lead out to a patio, we use for dinner parties. The white chargers are from Pier 1. I just love them! I used the toddler pink lacy skirt to cover my vase. I like to use these in my tablescapes. They can be found very reasonable at Ross. The wreath was on sale at Hobby Lobby. In fact, I bought two, so I can hang them on our front doors. I found the flower balls at TJMaxx. The green flatware is from Horchow on sale. Love the pretty polka dot napkins. The bunny chair covers are from the Dollar store. I found matching little bunny pails at Target, along with the bunny ears. 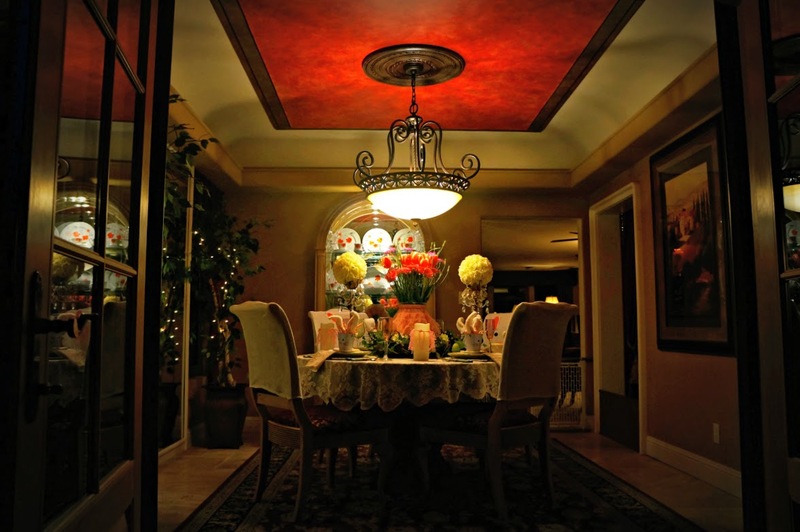 Here's a night view into our Breakfast room, with the french doors open. Happy early Easter....Many blessings to all. Very lovely Linda! Great colors! Hi Linda! Oh, your breakfast room is just so pretty and elegant. That is a beautiful china cabinet with those delightful dishes. 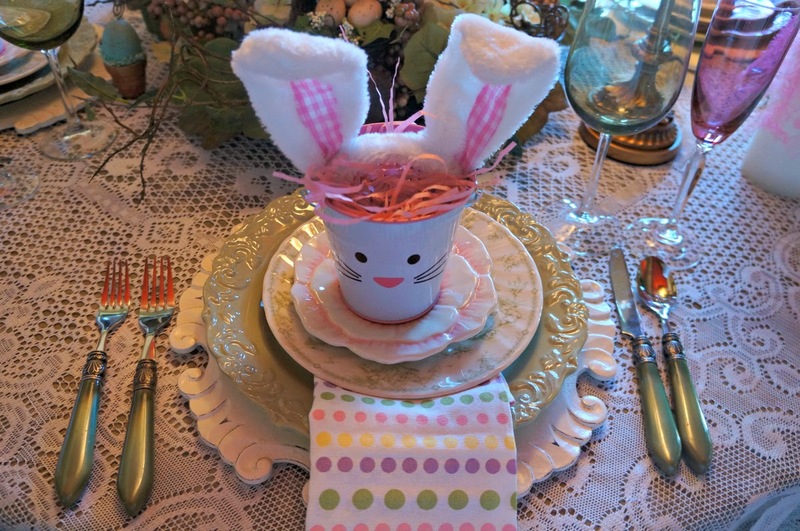 Now your Easter table is adorable. Who would think about using a little skirt for the vase for your centerpiece which is so pretty! Everything on the table is just perfect. Hope you're doing well. Hi Linda, I love what you have done! Easter is fast approaching and I usually do a small bunny display including a 'mini tree'-twigs decorated with hanging easter ornaments for the grandchildren. Your home is beautiful, very elegant. Good evening beautiful designer! WOW! That is one inviting, whimsical, lovely and inspiring table scape! Oh Linda, how lovely is that last shot with the open French doors, inviting us in! And thank you my friend, for coming to visit. YES, I will still be around, but I need to focus on my next path of blogging and it looks as if I'll post once a month. But I will still visit others. I get notifications of your new posts quite late, but when I do get them, I'll be here! Cute, cute table, Linda. Love that skirted vase and the bunny backed chairs! I love the way you put this together for Easter so sweet. I also so love looking into your room with the French doors open. I am so happy your test came out good God Bless. I love it all.....especially the bunny chair back covers! I am going to look for some at the Dollar store here tomorrow!! Easter is a great time to count our blessings......YOU are one of them!! 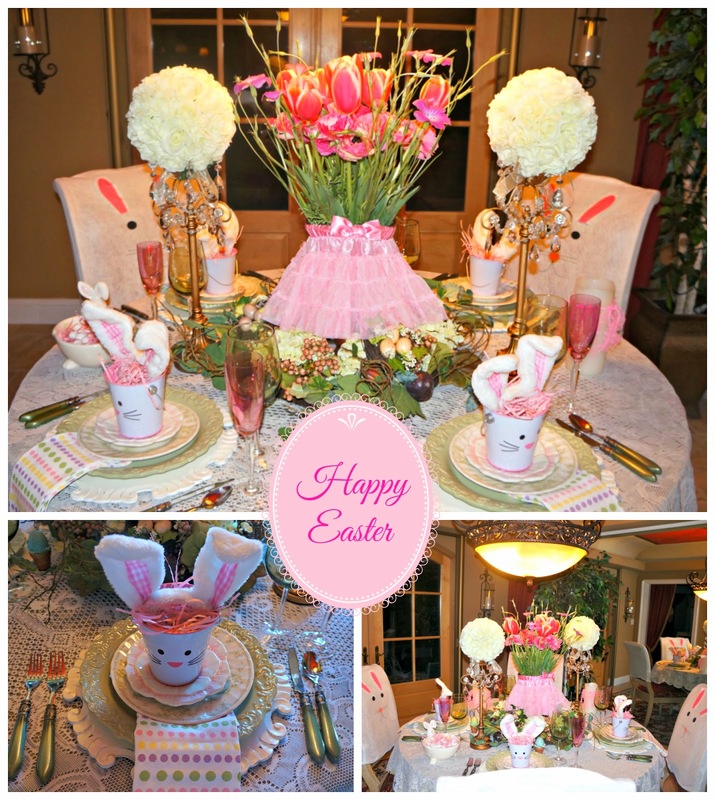 I love your Easter tablescape ! I saw the thumb at my blog and thought "It can't be! Ca it? 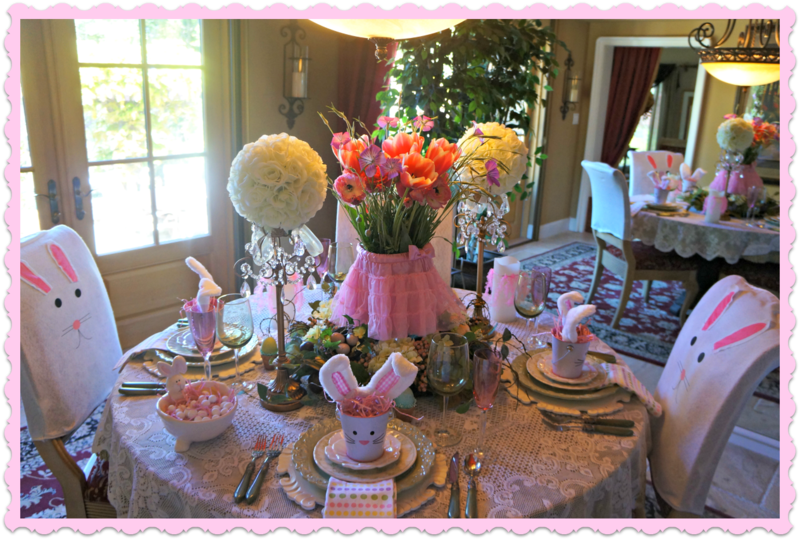 Linda EVEN has bunnie chair covers!!!" And how lovely and cosy this setting looks... That last picture did it even further. You have a Magical Home. Enjoy it and Easter! 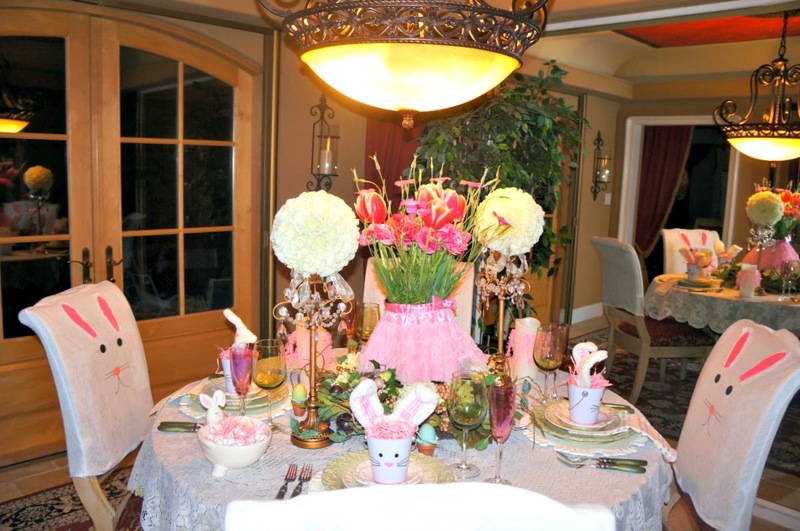 Hi Linda, gorgeous Easter tablescape. Love the look from the French doors. Everything is perfect and so inviting. Those chair covers are darling. What fun Easter inspiration you've shared, Linda. This is the next best thing to being a guest at your bunny table. I love it! I would ffeel like a kid again and that would be so nice! 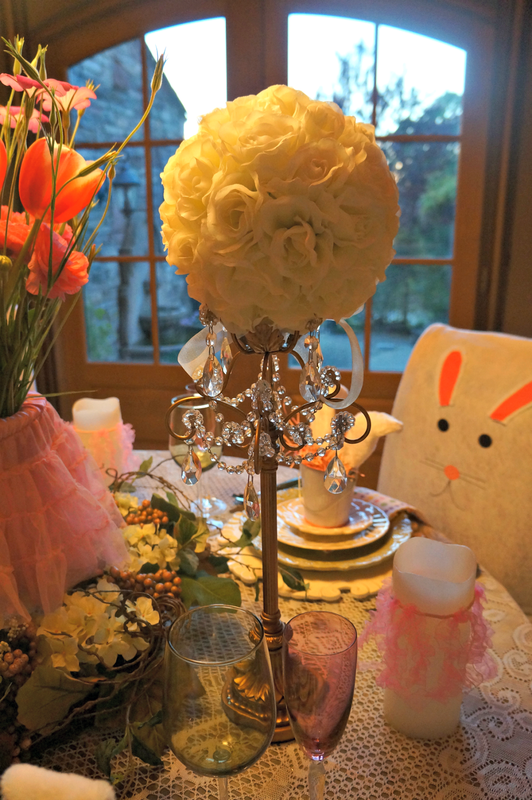 It's just the cutest bunny Easter table! I love it all. I love the whole table. I am antsy to get home to do some Easter decorating and tables! What a fun table! I want to wear some bunny ears now and enjoy acting like a drink while drinking like an adult...LOL Adorable! How fun and pretty Linda! The florals look so cute with the pink skirt covering and those cute pails with the bunny ears are adorable! Linda, I cannot even pick out my favorite aspect of this tablescape; it's all so wonderful and festive! That last shot from the patio doors makes it all the more inviting. Happy Easter! Linda, very cute tablescape. I would like to come hop over to eat at your table! I love the bunnies on the plates! What a cute idea to use a toddler skirt for your vase. It is adorable. I love the fresh flowers too. Linda you always have such amazing creations for every season and holliday and this bunny one is adorable! The dishes are all great and with bunnies on top, just so much fun! Hope you are having a lovely week. This if a wonderful Easter tablescape. You've incorporated so many interesting things. I know I want to rush out and find one of those cute toddler skirts to fit around a vase or bowl. Thanks for all the great ideas and thanks also for stopping by my blog and leaving your sweet comment. 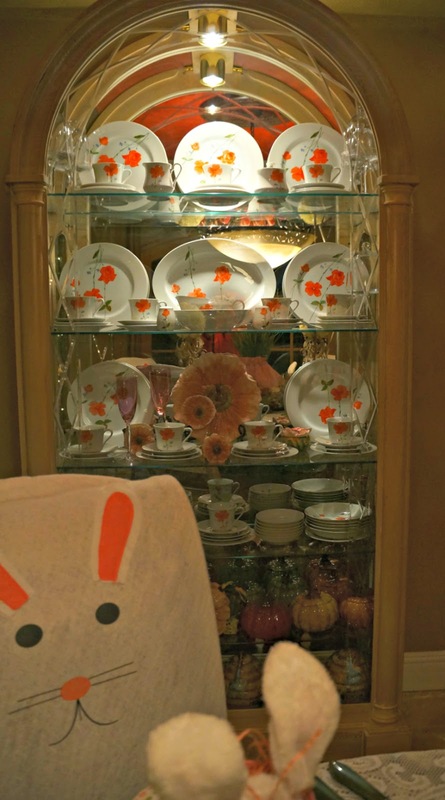 What fun... love your bunny tablescape. And lovely glimpses into your beautiful world. OMG, I *LOVE* those coffee cups and the ears!!! Soooooo cute! Adorable! Love the bunny chair covers! 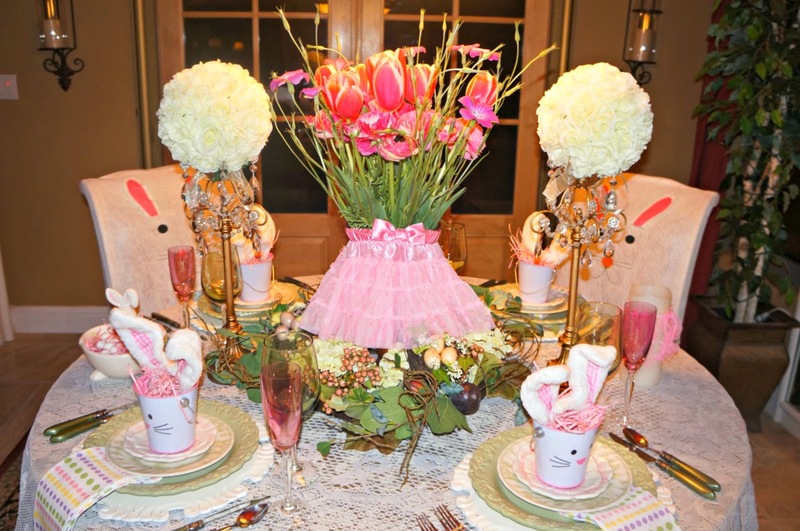 Beautiful bunny tablescape! 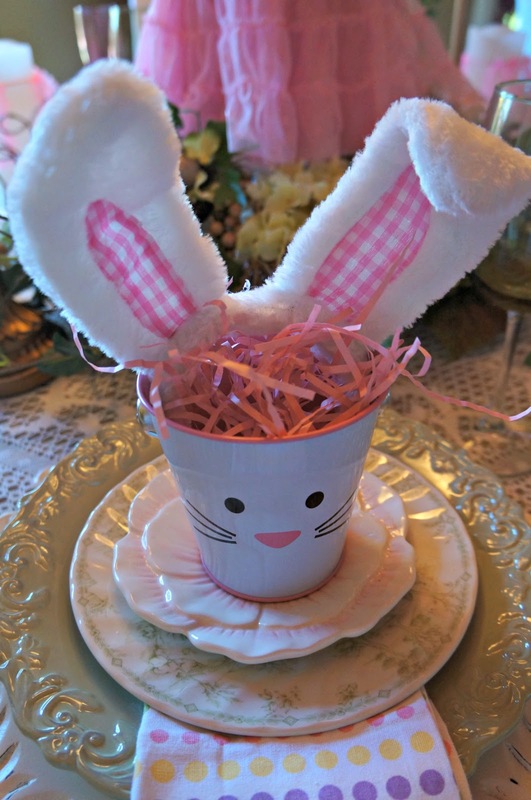 The cute bunny chair covers are wonderful for your Easter table. 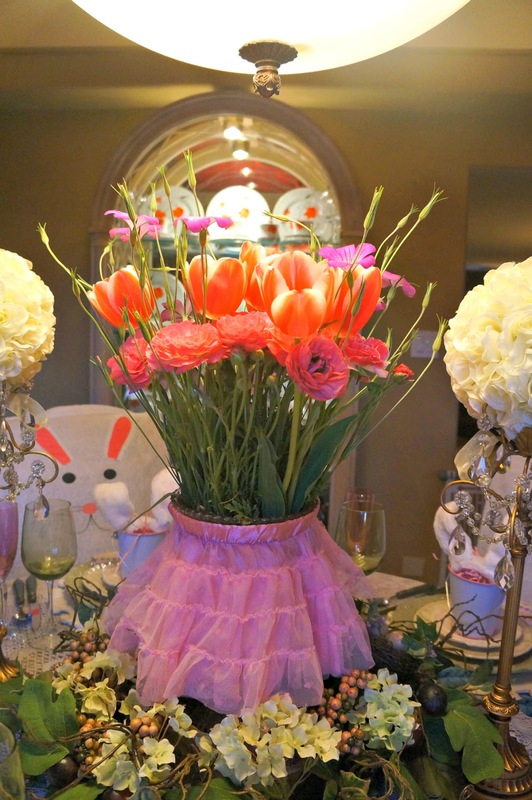 Your centerpiece is very creative with the toddler skirt! Have a great week! I just love the bunny ears in those cute little pails!!! What a fun addition to the table!!! You've really put together some wonderful elements! 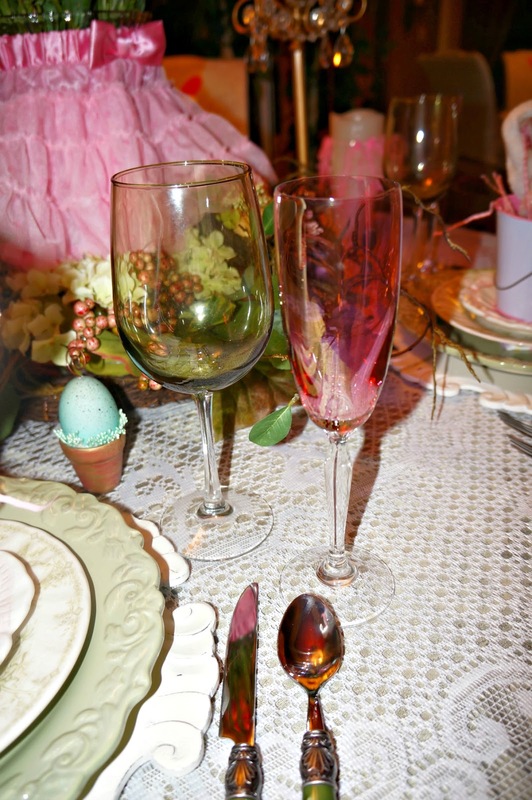 The bunny chair caps are a favorite as well as the pink champagne flutes. I love pink!!! Have a wonderful weekend, Linda!! Love, love, love! Your attention to detail is wonderful...great table. Such a pretty tablescape, Linda! I love how you combine dollar store with more high-end items! They fit together so perfectly! Thanks for sharing! Blessings from Bama!